To outfit the variegated desires of our precious patrons, we are highly captivated in making available best quality of Brass Toggle Valve to the prestigious clients. AKI TOGGLE VALVE are precision-machined valves are available in 1/8- and 1/4-inch sizes in both brass and stainless steel. Toggle valves are ideal for applications where instant on-off control is necessary. Toggle valves are rated to 200 psig. 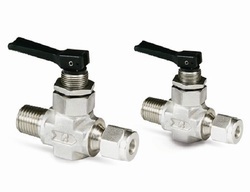 The Toggle valves with dual seats provide leak-tight bi-directional sealing. Clippard Toggle Stem Valve, Size: 1/2".1/4"
We have been counted amongst the most trusted names in this domain, engaged in providing Toggle Valve. - Prices Range - Rs. 500-800. - Prices are subjected to vary according to the buyers demand and the different sizes. We are offering GD Series Hand Toggle Valve. These are for maintaining the flow and pressure ranges with end fitting threading. The valve is fabricated for fine control action that needed precision manufacturing of each and every part of the needle valve. We are the leading entity of a wide range of Toggle Valves. This presented Toggle Valve can easily bear extreme high pressure of flowing liquid and gas. These valves are best in working and reliable in working. Our presented toggle valves are reliable in nature and easier to use. 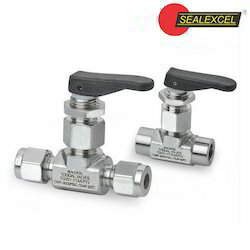 Professionals have made these toggle valves with the use of best and sturdier metal. These high quality precision machined valve are available is 1/8 and ¼ inch size in both brass and stainless steel. Toggle valves are ideal for applications where instant on-off control is necessary. Toggle valve are rated to 200 psig. The Toggle valve with dual seats provide leak teght bidirectional sealing.